Video surveillance is an industry where you really do 'get what you pay for'. Landfills are littered with inexpensive cameras and no-name DVR's that break after only two years, and never produced good video in the first place. WatchPoint Video designs are based on Enterprise class products from major world-class vendors such as Sony, Axis, Panasonic, Intel, Seagate, and other highly reputable companies. For example, our designs are based on server-rated Intel motherboards and chassis, not inexpensive desktop systems. The disk drives are Seagate 'ES' enterprise drives (extended wear and duty cycle), and the operating system partition will be in a RAID array for fail-safe reliability. 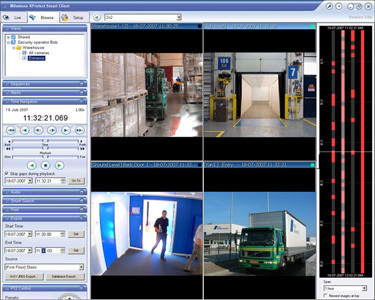 The Video Management software for these systems is provided by Milestone Systems, the industry leader in network based video surveillance. With more than 40,000 installations world-wide, the Milestone XProtect software is the most reliable, fully featured, and easy-to-use product available today. For more information about these products visit the Milestone website, or contact WatchPoint Video for a quote.